The New York Times Magazine (12-2-2018) article The Insect Apocalypse is Here by Brooke Jarvis reveals to people like me, who rarely pay attention to most insects, that the population of bugs in the world is declining. Some of us can remember years when driving through the summer nights required hours of cleaning the car windows, removing all the dead bugs. No more. We suddenly realize that particular chore has not been necessary for years. Why not? Some answers come easily. Farmers and gardeners use pesticides which kills many insects. But other causes include habitat loss, the killing of native weeds, single-crop agriculture, invasive species, light pollution, highway traffic, and climate change is possibly the newest threat. As a long time gardener I have been aware of the declining number of Monarch butterflies and bees. Many years ago, when we lived on 30 acres of fields in Heath, we enjoyed the Monarch migration in late summer when there were flocks of Monarchs fueling up on the mint that was running rampant in a field. Then there were years when we did not see these clouds of butterflies. Now I get all excited in my small urban garden to see five Monarchs on my coneflowers, bee balm, asters and asclepias (milkweeds). Aesclepias tuberosa for the honey bees. The is where they drink and lay their eggs. As a former beekeeper aware of threats to bees I also plant cardinal flowers, obedient plant, buttonbush, culver’s root, and turtlehead and welcome every kind of bee that visits. I am doing what I can to support these ‘bugs’ but it will take more. Tallamy has taken his own action. He now lives in a rural area between Philadelphia and Baltimore. He planted his ten acre patch with native plants, that will sustain many bugs. Now he has 861 species of moths and 54 species of breeding birds that feed on insects. Unlike my friends who are birders, I did not know that almost all birds need insects to feed their fledglings. Insects are high in protein and vital. The German Krefeld Entomological Society, a group of mostly amateur naturalists, have been keeping records of insects for over a hundred years. With an article by Sally McGrane in the NYTImes in 2017 they sounded the alarm. Others were beginning to notice the lack of bugs, but no one else had a record of what was. I think we will all get more serious about what the risks are. The Insect Apocalypse is Here is a fascinating article and I am still taking it all in. Leaves are falling, some flower stalks have turned brown and brittle; it’s time for the fall clean up. I have been cutting back iris and daylily foliage which was looking less and less attractive every day. 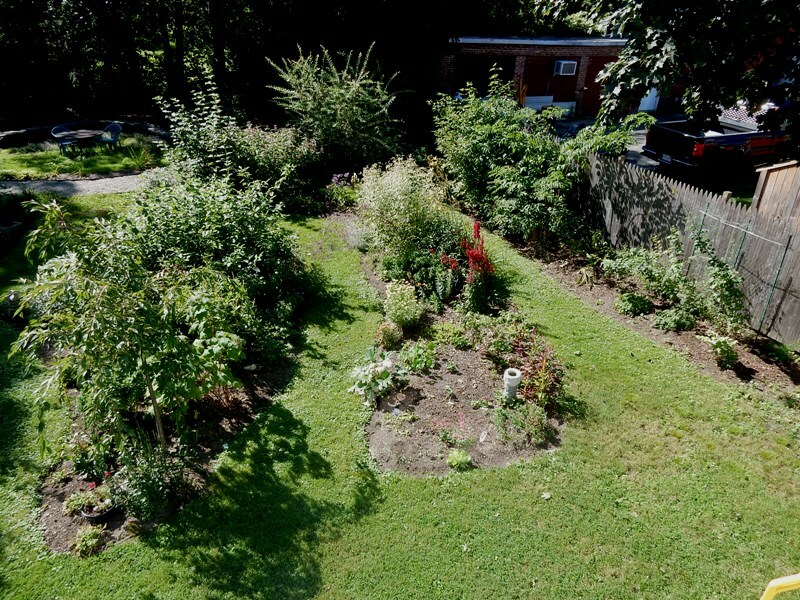 Cutting back is one way to make the garden look neater and a bit more serene. It is also a way to see clearly which clumps will be ready for dividing in the spring. Where can these divisions make the most impact? Or maybe the divisions can be sold at spring plant sales like those for the Bridge of Flowers or the Greenfield Garden Club. I also started to cut back the large stand of six foot tall chelone, turtlehead. Cutting back the waning but still tall or spready perennials in the garden make it easier to see the plants with autumnal and winter interest like winterberry. All of these large leaves and plant stalks go into a special big compost pile. In the spring we will turn the pile, and with a little luck the bottom half of that pile will be good compost to put on the garden beds. Walking through the autumn garden shows the spots of failure. My sweet peas didn’t get enough sun. The stringbeans didn’t get proper support and were too crowded. The smaller honeysuckle wasn’t as small as I thought; it needs a real trellis. My wanderings show that the vigorous and twining Grandpa Ott morning glory is also going to need careful removal from the honeysuckle. Fall clean-up doesn’t happen in one day, and it doesn’t need to. Unlike chores in the spring which seem to happen all at once, I feel we have more time in the fall, especially this year because the weather has been so mild. The leaves fall and have to be raked. Then more leaves fall and they have to be raked. Fall clean up encourages a slow and steady approach. Our biggest problem with clean up this year is the dead brown leaves of our big horse chestnut. We noticed other horse chestnut trees in town also shedding their big brown leaf clusters early. I have tried to do some research to confirm or disprove the rumor we heard that there is a fungus attacking these trees, and that the fallen leaves should be collected and removed, not put in the compost pile. Our horse chestnut is very tall and branches are not within reach. I cannot see the leaves clearly until they fall off. I did find examples on line of leaf blotch which is caused by a fungus, but I am not able to see my leaves early enough in the fungus development stage to see if they develop as shown in the photos. In any event, we are trying to rake up as many of those leaves as possible, bagging them up and putting them out for the trash collector. 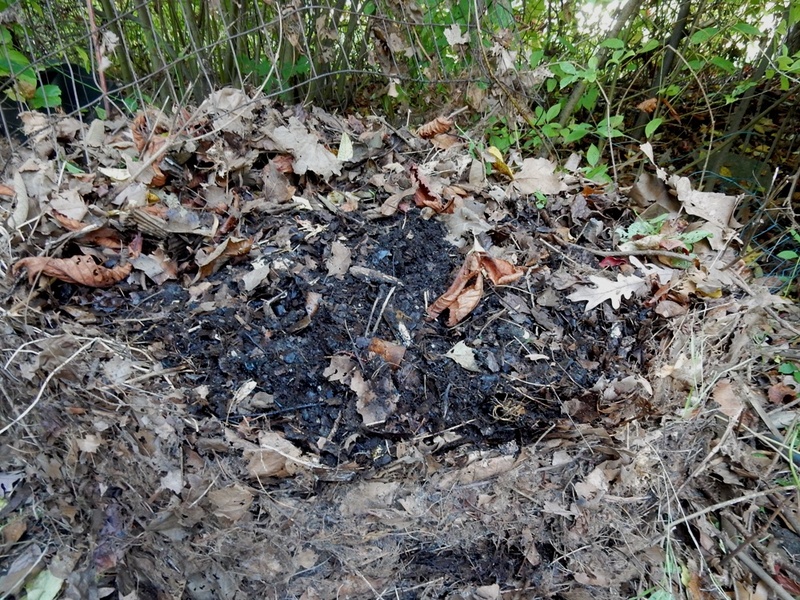 The leaf blotch fungus, Guignardia aesculi, can overwinter in a compost pile and be a threat next year. While we are doing our best to get rid of the horse chestnut leaves, we welcome the sycamore, Japanese lilac, and river birch leaves as well as the maple and oak leaves from our neighbors’ trees. There are plenty of these over the course of the fall. I collect them and put them into a five foot tall wire cage, pressing them down as the season progresses. We can watch the pile melt down and stand in awe of the speed of the rotting process. I did not invent the idea of a big wire bin. That was the late Larry Lightner’s idea. He was a marvelous gardener and years ago was responsible for many of the gardens on the Northfield Mount Hermon campus. 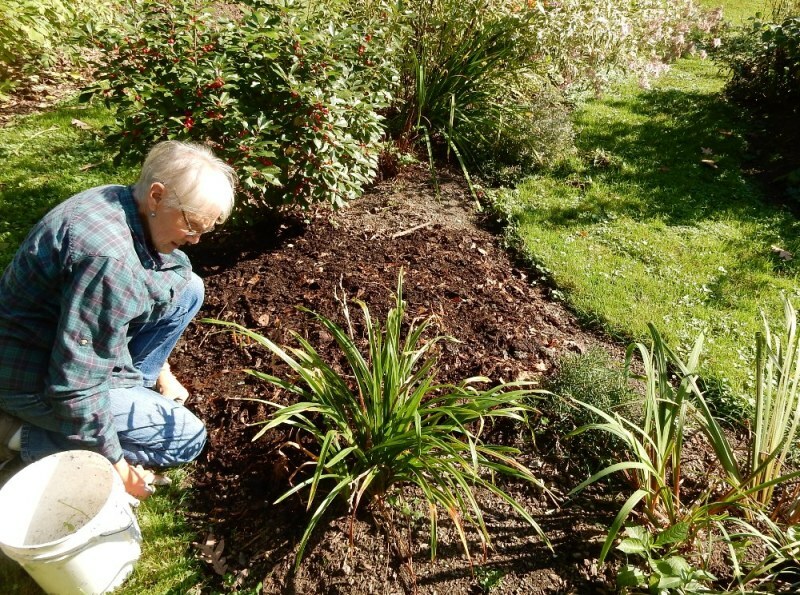 He collected leaves and made what he called ‘cold compost.’ The compost bins that many of us use for our kitchen scraps, grass cuttings and weeds, use the heat created by the rotting process to make compost. In a different process leaves break down in their aerated wire bin without heat. 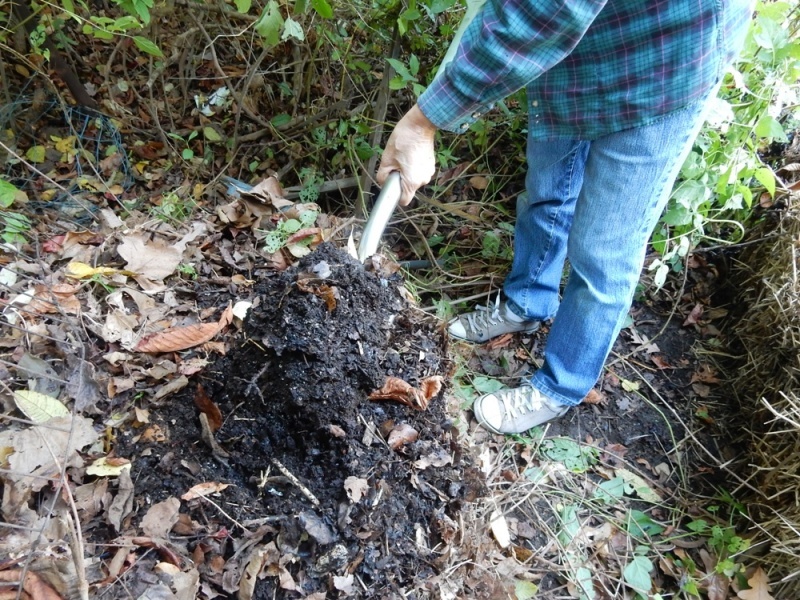 It does take a full year, and sometimes longer to be usable, but it is valuable compost. Lightner even planted in his cold compost bins. He made them about two or three feet tall, sometimes circular or of any other shape that suited him. He kept adding leaves all fall until the bins were full. In the spring he would top off the planting bin with cold compost from another bin. The newly full bin was ready for planting. He would make an indentation in the cold compost, add about a quart of soil, and then plant a vegetable or plant start. One big bin could hold numerous starts. These bins did need to be kept well watered, but plants got plenty of nutrition from the still rotting leaves and thrived. We just pulled our wire bin up and off the rotted leaves we collected all last fall. Unrotted leaves remainrd along the outside edges, but the rest of the leaves have rotted into good compost. I am spreading that compost over my beds as I cut back and weed. As soon as I spread all of that finished compost, we’ll set up the bin again and pile in this year’s crop of leaves. This is a wonderful cycle. It makes me happy to know that I can look forward to a compost harvest every fall. Soil Restoration is important. I don’t always understand the science behind good garden practices, but an afternoon with Ben Grosscup helped me think about my soil in new ways. Grosscup began working with the Northeastern Organic Farming Association NOFA) right out of college. He was part of the efforts to organize putting bans on Genetically Modified Organisms (GMOs) and efforts to label foods if they did include GMO’s. He organized educational events and seminars for farmers and others interested in the quality of our food supply. Over the years he learned about carbon restoration of our soil. 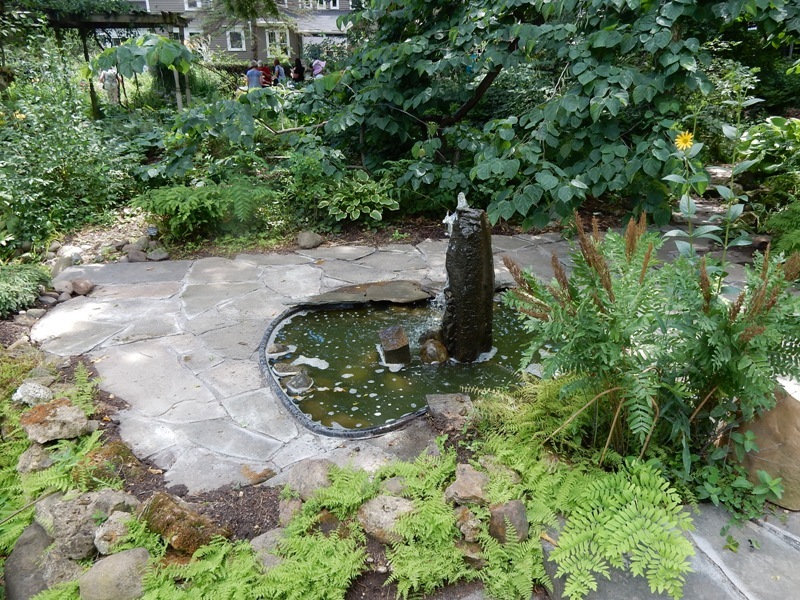 I went to see Grosscup’s in-town half acre garden to get a better understanding of what carbon restoration means and the role of microbes in the soil. The first thing we did was look at the cover crops, radishes, vetch and winter rye, that Grosscup planted after his vegetable crops were harvested. “I plant a variety of cover crops in one space because each species of plant calls a different microbial community,” he said. 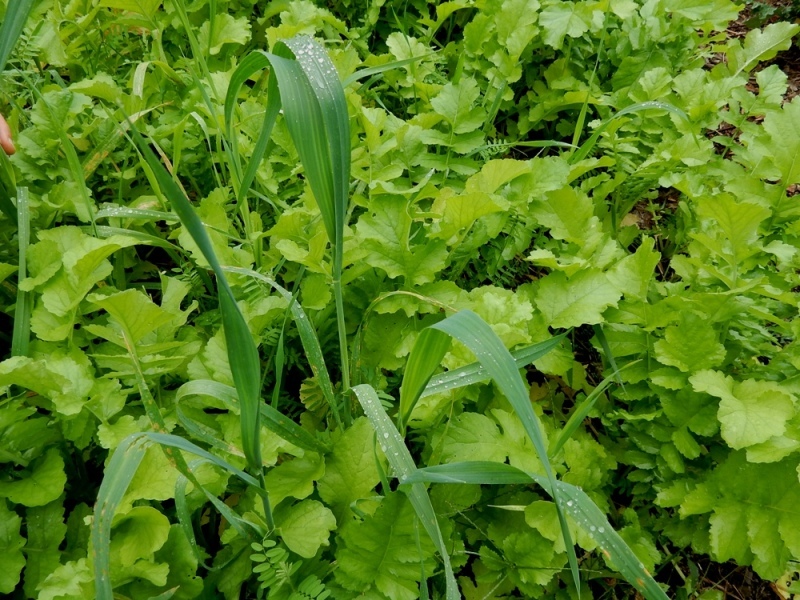 I had understood that cover crops like radishes, winter rye, peas, and oats had enough time in late summer to cover the soil over the winter protecting it from erosion while the roots went deep in the soil to bring up valuable nutrients. I also knew that winter rye would send up shoots that survived the winter and continueto grow in the spring while annual crops like peas and oats would die. I did not understand how you could plant in a bed that was full of winter rye in the spring or any other cover crops. All was about to be revealed. First, there are two types of cover crops, perennial and annual. Winter rye is a perennial crop in that will survive the winter and continue to grow in the spring. When it is nearly time to plant new vegetable crops in the spring Grosscup pulls up the winter rye, covers the bed with newspapers and lays the harvested winter rye on top. He supplies the newspaper barrier to prevent the rye from re-rooting. He uses three techniques when planting the newspaper covered rows. First he waters the newspaper well, and the soil beneath. Then he can puncture little holes in the newspaper and insert his vegetable starts. Or he can plant his hills of cucumbers, squash, or beans by making the holes in the paper for the seeds. Or he can create a shallow long trough through the paper to plant seeds. As in any planting he needs to keep it well watered until the seeds or young plants are well established. Annual ground covers like peas and oats will not survive the winter. Their roots will bring up nutrients and the dead plants will compost in place giving organic matter and nutrients back to the soil. There are three goals: to cover the soil and protect it from erosion, to enrich the soil, and to avoid disturbing the soil which would release carbon into the atmosphere. We all have to remember that soil is alive. It is full of fungi, bacteria, nematodes and many other invisible creatures. It has been estimated that a teaspoon of healthy soil contains more microbes than there are people on earth. Grosscup explained that these creatures need sugars created by photosynthesis. Of course I needed to give myself a little review course about photosynthesis. Chlorophyll in green plants takes the energy from sunlight to break up the water (H2O) molecules in the plant. The plant breathes some of the oxygen back into the atmosphere. The saved molecules are bound to carbon dioxide molecules (CO2) to ultimately create simple carbohydrates like glucose (C6H1206). “These sugars are exudated into the soil through the plant’s roots” Grossup said. The tools of what we now call conventional agriculture include fertilizers which are attempting to give the soil the nutritional elements that plowing and tilling has removed. We gardeners see this when we buy a bag of fertilizer and notice the identifying NPK numbers 5-10-5 or 5-4-1 which refers to the percentage of nitrogen, phosphorus and potassium in that fertilizer. What these fertilizers do not do is provide food for all the microbial life in the soil which is so vital. Grosscup has a large sunny vegetable garden next to his house. He says he and his partner rarely have to buy vegetables, and they have three chickens to provide eggs, and compost. They also have fruit trees and berries, as well as a section they call a pollinator garden, filled with perennial flowers that attract bees and other pollinators. The sloping area in back of the house is very much a project in progress. Norway maples were taken down and removed. Some spaces have been covered with cardboard to kill all the weeds growing in the area. Other spaces are farther along in the process and have been planted with annual cover crops with the intent they be ready for planting in the spring. Other areas have been planted with honeyberries, gooseberries and goji berries and a few fruit trees. The ground around them has also been planted with annual cover crops to keep building the soil. I always say the garden path leads to many fields. This week I explored a path that led into some fascinating science. The end of August view from the upstairs window shows not only a full garden, but my most recent project of a wine bottle hose guard on the left. Also in the center of that bed is a beautiful glass “flower” given to us by the sister of a dear friend. You can’t see it very well here, but as soon as I see the sun shining on it I’ll give a better photo. I wanted to get a good view of the most norther island bed and you can see that more work needs to be done at the east end. The pagoda dogwood will get bigger so I am thinking about low growing plants. 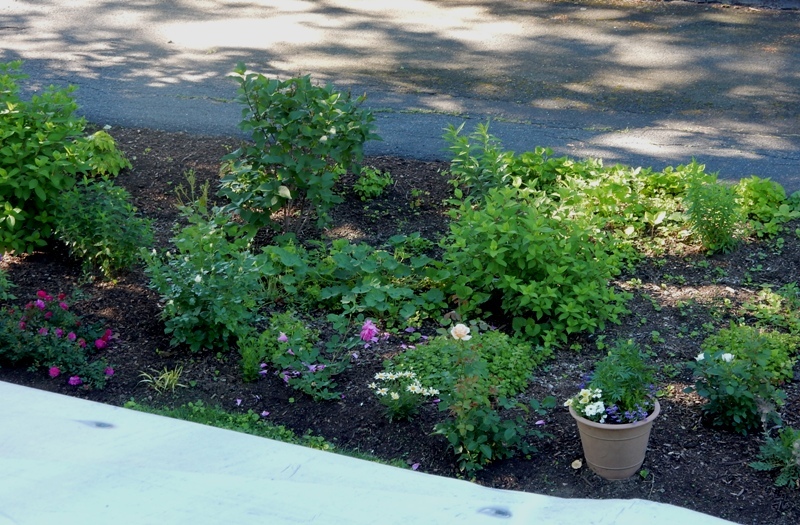 I rarely show photos of the South Shrub Border, but it is the oldest planting in the garden and right now the important bloomers are three hydrangeas, Limelight, Angel Blush and Firelight, fronted by roses, some of which are still putting out blooms. The two pink roses, one a low grower, and the other will be a large bush – Purple Rain and Thomas Affleck. 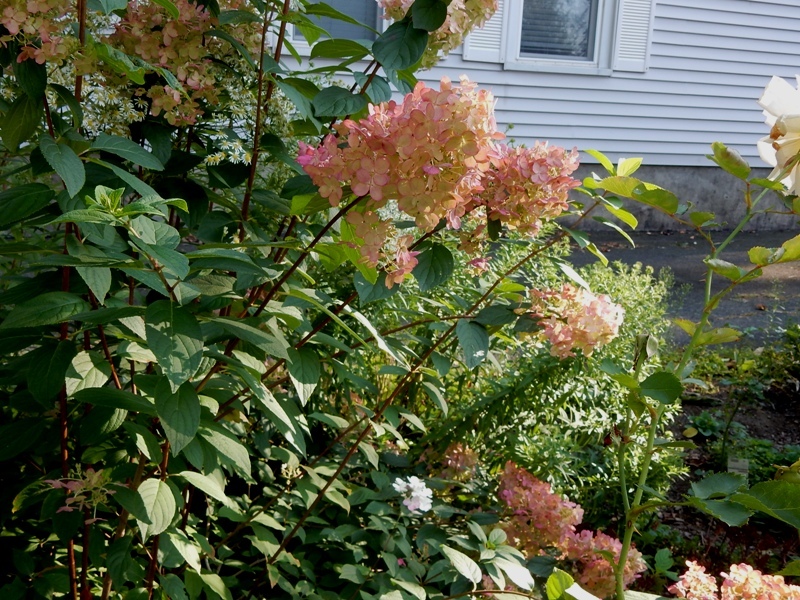 The Firelight hydrangea (not Angel Blush as typed earlier) is coming into full blushing color. Lovely. A lovely end to August. The South Border One Year Later. The edible garden tour arranged by Rabbi Andrea Cohen-Kiener of TempleIsrael took us to several gardens within walking distance of my house. 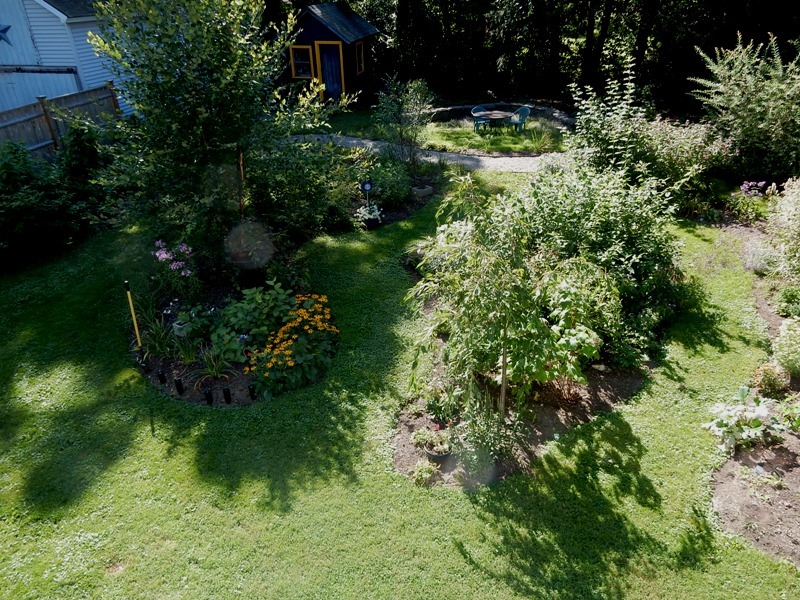 The first garden we visited is a very pretty small garden created by Lisa Ranghelli and Bram Moreinis. This was their first garden and they showed their wisdom by saying they thought it best to start small. We admired the design, the assortment of vegetables and the exclamation points of marigolds. But we also noticed a summer squash plant that had yellowing and drooping foliage. How could a single plant in a well tended garden droop for lack of water? Well, of course, the problem was not a lack of water. Nancee Bershof, an experienced gardener, took one look at the plant and then named the problem – the presence of squash borers. Never having any experience with squash borers I was as surprised as anyone. (It was probably too cold up in Heath.) The plant was pulled out and passed around enabling us all to examine the damage so that we would recognize the problem in our own gardens. When I got home that evening I did recognize the problem in my own edible garden. I am only growing zucchini and yellow summer squash, so I could not see that there was anything to do but pull out the affected plants. However, if you plant butternut, or other squash growing on a vine, you can slit the stem and try to pull out the borer. If you are successful, you can then bury a section of the vine and it can make new roots and continue growing. Prevention is the best solution to vine borers. Right after planting seeds, cover the site with a floating row cover to protect the plants as they emerge from the squash borer moth. You can also plant radish seeds around each squash hill because they will repel borers and squash bugs. When the summer squash plants have established stems you can wrap two inches of stem with aluminum foil to protect them, and redo that foil wrapping every week or so, as the plant grows. The foil must touch the soil. Or you can make use of one of the safest organic pesticides, Bacillus thuringiensis often referred to as simply BT. You can begin a weekly regime of spraying with Btk, Bacillus thuringiensis kurstaki that can specifically control caterpillar pests like cabbage moths and vine borers. 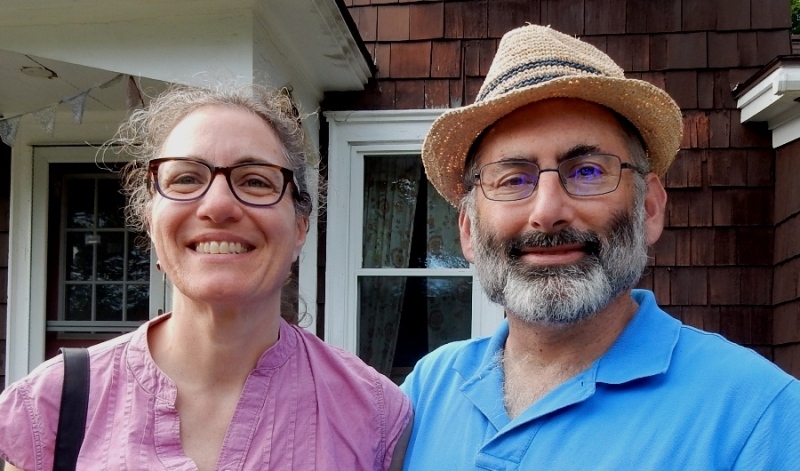 Mary Chicoine and Glen Ayers care for another edible garden, a veritable urban homestead amazing in its size and variety. There were fruit trees, a strawberry bed, cucumber trellises and countless vegetables. Well staked tomatoes grew in one area and we were told that the staking system was designed to keep the tomato foliage up off the ground to help prevent tomato blights. Fortunately we did not see any tomato blights on our tour, but recently this has been a threat to our vegetable gardens and a disaster for farms. Tomato blights are caused by wind borne fungi spores. 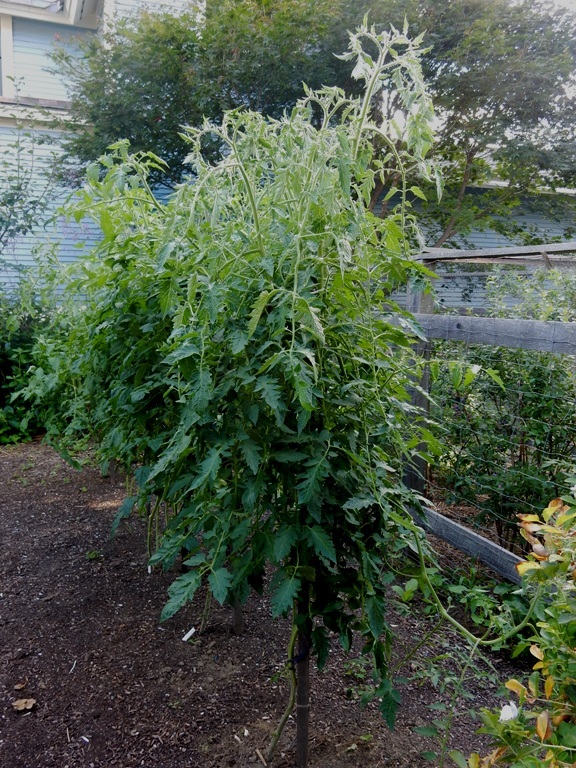 The spores take hold of tomato foliage when it is wet for several hours. There are several ways to reduce the threat. Plant the tomatoes in a way that allows good air circulation and keeps the plants off the ground. Use drip irrigation or at least water early in the day so foliage will dry quickly. Clean up all diseased plants and foliage and remove them. 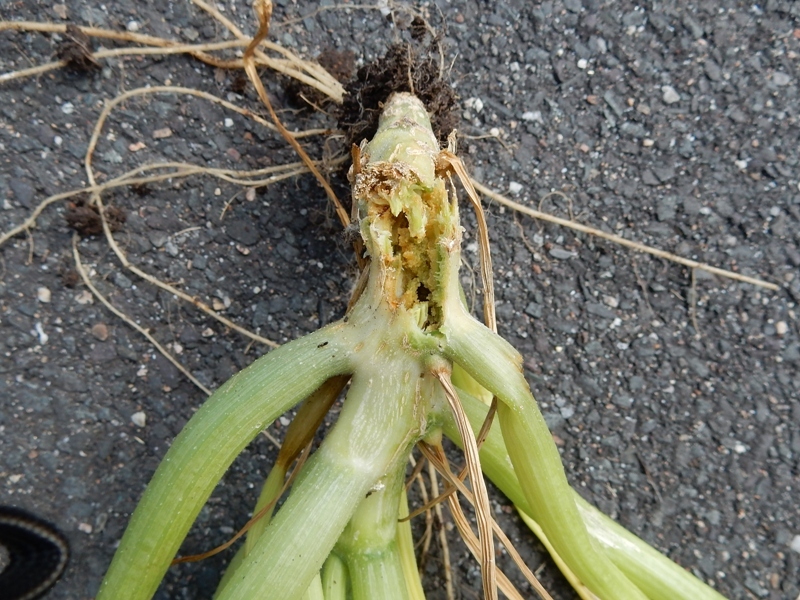 It is best not to compost affected plants, and always be sure to rotate crops from year to year. Prevention is best, but if blight is caught very early it might be possible to attack the problem with fungicides like copper spray, oil based fungicides like Neem, or Actinovate a bacterial fungicide. Happily, there are a number of blight resistant tomato varieties from Jasper Hybrid cherry tomato, Brandywine, Yellow Pear, Tigrella and Roma, among others. It was inspiring to visit these edible gardens and see how much food can be grown on a town lot. I must also say that the riotously growing pollinator plants in the gardens, coneflowers, bee balm, rudbeckia, zinnias and others added color and beauty. As I take stock of my edible garden this fall I am trying to think of ways I might add a few more edibles than I have so far. 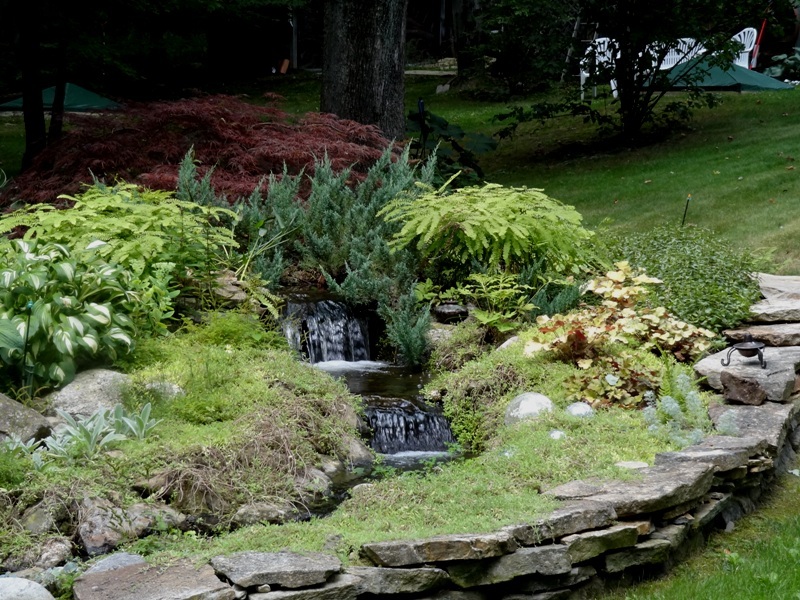 The Master Gardeners organized a wonderful garden tour to Philadelphia and environs. Both Chanticleer and the Mt.CubaCenter gave us the shade of a woodland and I am so glad both were included. 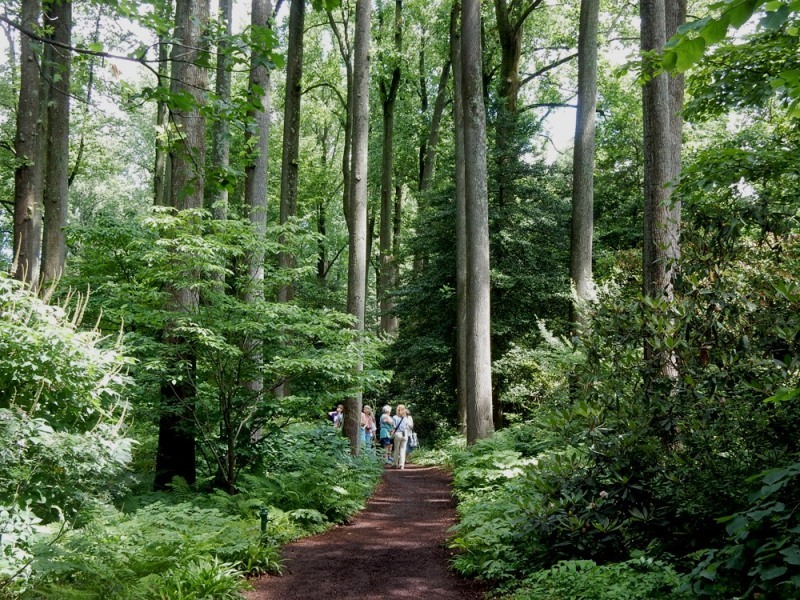 The first garden we went to was Chanticleer. Once the Rosengarten estate, it opened as a public garden in 1993. I had expected lush, but neat beds of exotic flowers, but what I found at Chanticleer was a peaceful garden with large potted plants in the terraces around the house, a vegetable garden that donated its produce to the local food bank, and sunny “wildflower” hills with paths that led down to shady woodlands,. That shade was especially welcome on what was the hottest day of our tour. 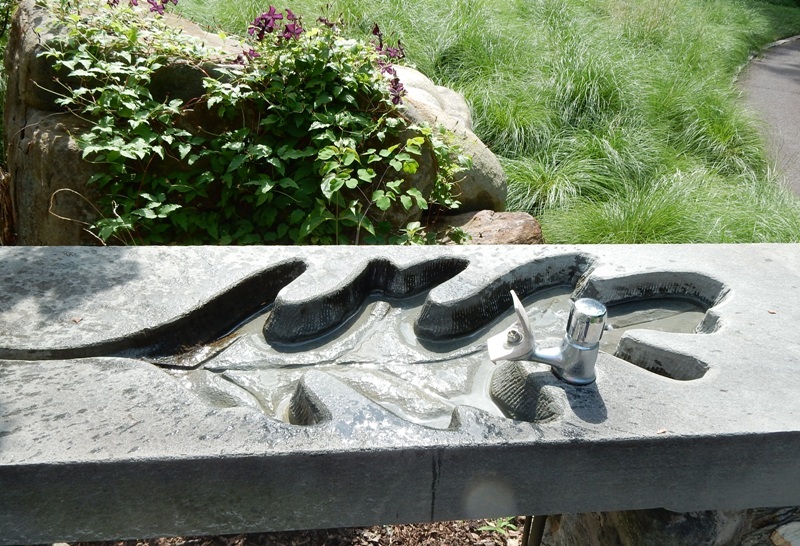 One of the design and functional elements in the garden that provided sustainability for visitors was the presence of drinking fountains! It has been a long time since I have seen drinking fountains in public spaces and to find drinking water on a blistering hot day was a blessing. In addition we found beautiful handmade bridge railings and benches for moments to rest and enjoy the tranquility of the shade. Every sense was engaged, the whisper of the breezes in the trees, the play of light and shadow over the green plantings, and the quieting of busy thoughts. Though the woodlands provided green shade there was color like the Indian pinks which were actually red with a touch of yellow, and buttery yellow corydalis. On our second day we traveled to the Mt.Cuba Center where our group spent most of our time in a shady woodland. When the Copeland family bought this land it was always their intent “to be a place where people will learn to appreciate our native plants and to see how these plants can enrich their lives so that they, in turn, will become conservators of our natural habitats.” It was just a joy to wander through the woodland filled with rhododendrons beneath tall tulip poplars that had been limbed up so high that the effect was of strolling past pillars and down a cathedral aisle. One of the trees had been trimmed with a “coronet cut” which means that instead of just slicing off the top of a damaged tree, the cut imitated the irregular way a tree might have been naturally damaged and broken. That natural cut causes a faster rotting process that attracts birds and insects, a kind of conservation that goes beyond just caring for plants on the ground. As we walked along the light and shade would alter and shift providing enough sunlight to allow plants to thrive and bloom. There were many native oakleaf hydrangeas in the woodland. Our guide pointed out that the ray flowers, what we think of as real flowers, are only intended to attract insects to the tiny ‘true’ flowers which is where the nectar and pollen are located. I am going to examine the hydrangeas I planted to see if these hybrids provide the same temptations to pollinators. 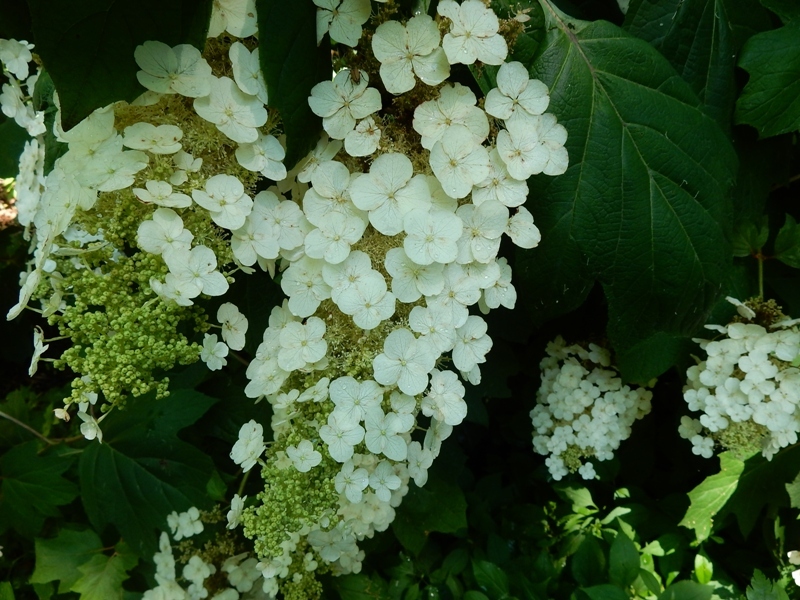 I had wanted to buy at least one oakleaf hydrangea for our South Border, but I could not find one locally in 2015 – and I was too impatient to wait another season to plant. One path led to a series of ponds that reflected the dappled sunlight and the surrounding trees. 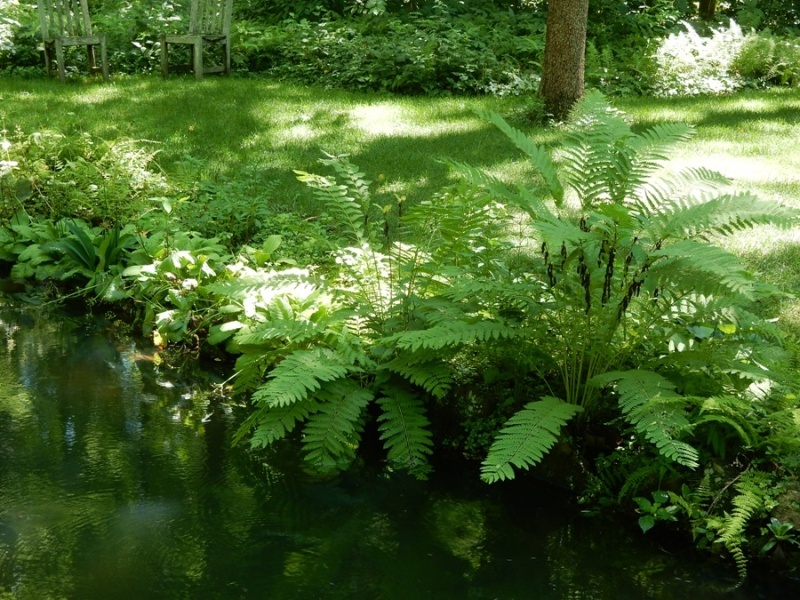 I was fascinated and inspired to see primroses, irises and ferns living on the banks of the ponds, as well as other unidentified water-loving plants. I began to think this was the answer to our question of how to handle the edges of the “dry stream bed” we are creating as part of our flood management plan. 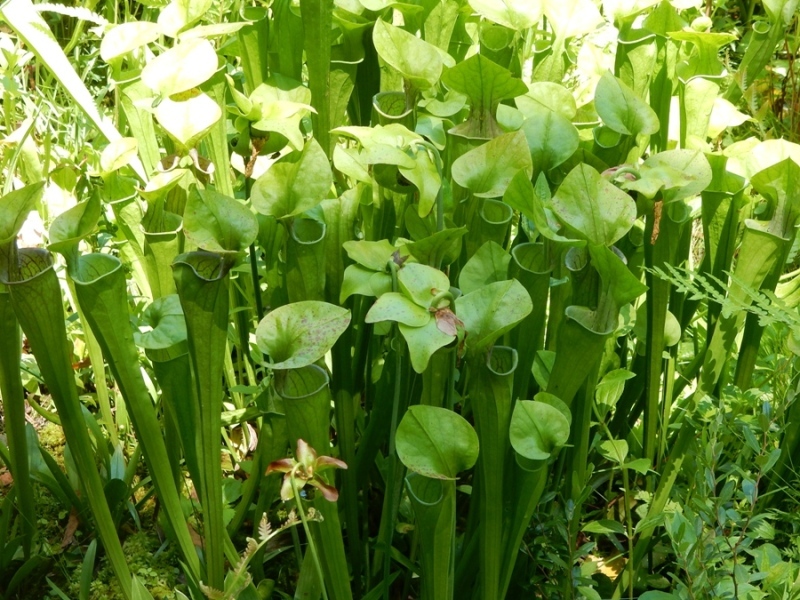 One pond included a boggy section that was planted with pitcher plants. Pitcher plants are carnivorous plants that lure insects that drown in its fluids. The insects decay and the enzymes produced by the plant allow the plant to absorb all the nutrients. These are fascinating plants and always exciting to young children who visit the garden. I was paying particular attention to low growing plants because our low maintenance garden strategy is to have large shrubs, low ground covers and a few flowering perennials and annuals to provide color. We saw large areas of pachysandra procumbens, a native plant also known as Allegheny spurge. It looks a lot like the pachysandra we see in so many gardens, and it produces small fragrant blossoms in the spring, but the leaves are not as shiny. Green and gold, Chrysogonum virginiana, is only six inches tall but the small yellow flowers bloom in spring and fall. It likes moist shade, and is hardy in Greenfield. I have not seen this used locally, but I will be on the watch, and will be checking the offerings at Nasami Farm, the native plant nursery in Whately. There was so much to see at these two gardens that included sunny and formal areas as well as the woodlands, but it was thought-provoking to consider that these two families were thinking of the importance of native plants and conservation, long before popular garden books, magazines, and even botanical gardens stressed the importance of these issues. 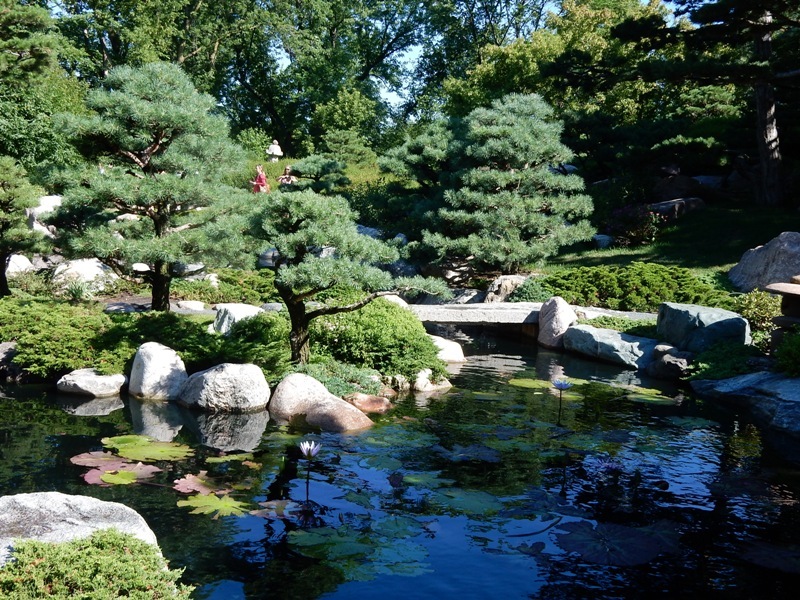 Visiting these gardens give us examples of beauty that can inspire us as we consider changes in our own gardens. And there are always changes in our gardens. On this World Water Day I want to share some of my water photos. 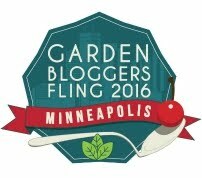 This group of gardeners has been visiting Minneapolis area gardens on a hot summer day. 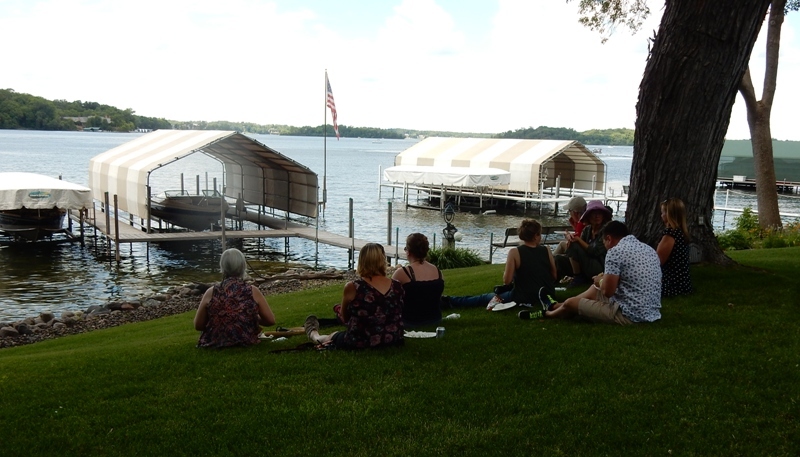 It was bliss to sit in the shade and enjoy the lake breeze and serenity. 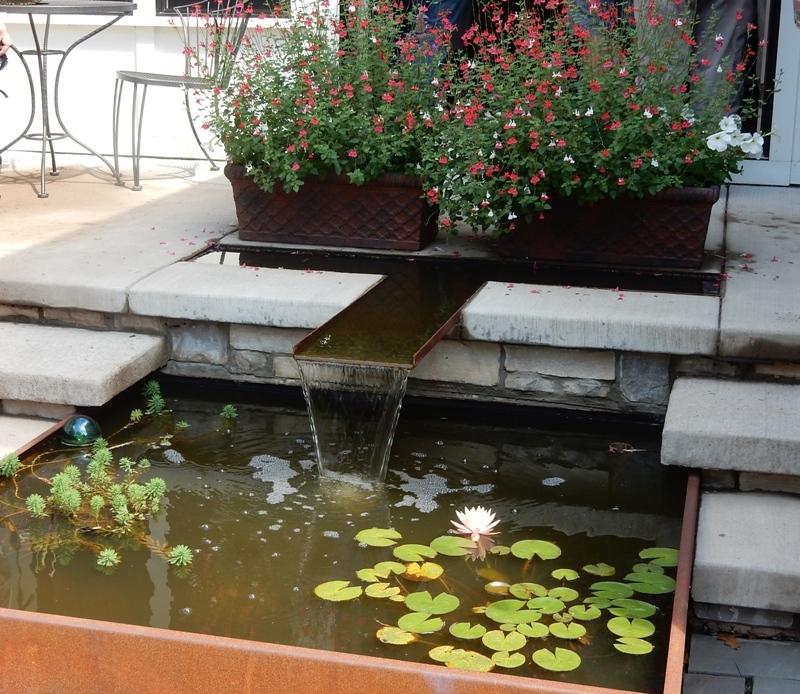 We can’t all have a lake in our garden, but we can arrange to have fountains like this patio fountain in Minneapolis. This waterfall was carefully ‘tuned’ with each step of the fall placed at a particular height to make a certain burbling sound. 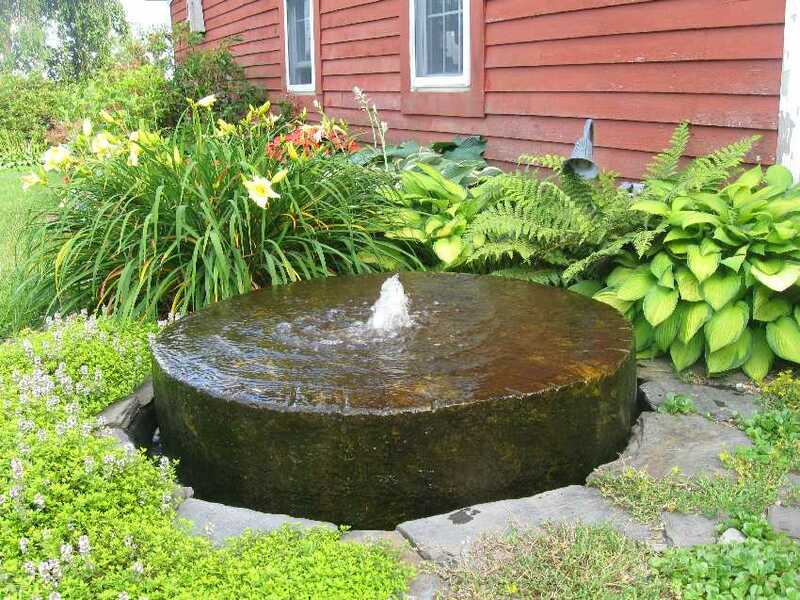 A Greenfield gardener knew just what to do with this old millstone – she made it a fountain. 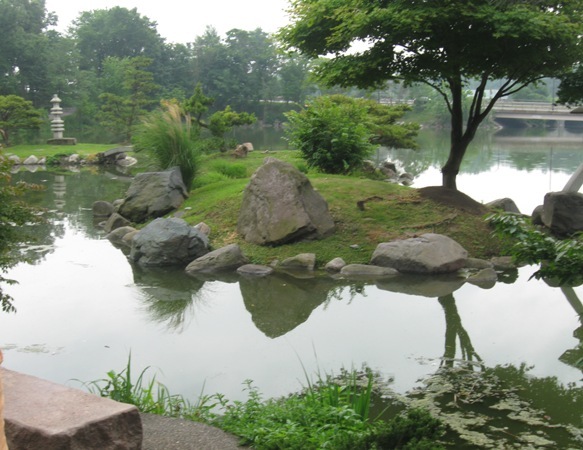 An important element in the serenity of a Japanese garden is the water. All of these pretty photos are of recreational or ornamental water in gardens, and yet the water we most value is the water that comes out of our kitchen taps. We are fortunate in the U.S. to have good clean drinking water, but even here we know there have been contaminated water supplies or pipes. We must be vigilant. 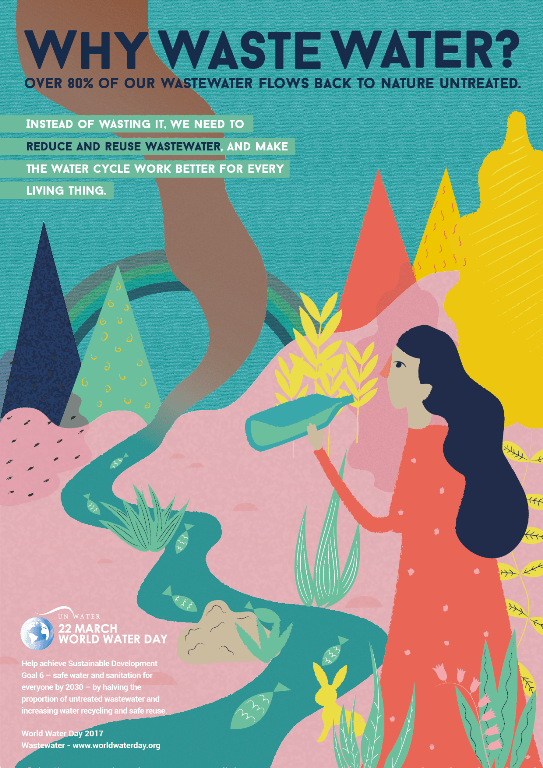 How will you mark World Water Day? Today is World Water Day which teaches us that 1.5 billion people around the world do not have clean uncontaminated water to drink. World Water Day, on 22 March every year, is about taking action on water issues. In 2017, the theme is wastewater and the campaign, ‘Why waste water?’, is about reducing and reusing wastewater. Sustainable Development Goal (SDG) target 6.3 requires us by 2030 to “improve water quality by reducing pollution, eliminating dumping and minimizing release of hazardous chemicals and materials, halving the proportion of untreated wastewater and substantially increasing recycling and safe reuse globally.” Progress towards target 6.3 will also help achieve the SDGs on health and well-being (SDG 3), safe water and sanitation (SDG 6), affordable and clean energy (SDG 7), sustainable cities and communities (SDG 11), life below water (SDG 14), and life on land among others. TOP LINE MESSAGES • Globally, over 80% of the wastewater generated by society flows back into the ecosystem without being treated or reused. 1.8 billion people use a source of drinking water contaminated with faeces2 , putting them at risk of contracting cholera, dysentery, typhoid and polio. Unsafe water, poor sanitation and hygiene cause around 842,000 deaths each year. 663 million people still lack improved drinking water sources. The costs of wastewater management are greatly outweighed by the benefits to human health, economic development and environmental sustainability – providing new business opportunities and creating more ‘green’ jobs. Water has to be carefully managed during every part of the water cycle: from fresh water abstraction, pre-treatment, distribution, use, collection and post-treatment, to the use of treated wastewater and its ultimate return to the environment, ready to be abstracted to start the cycle again. Due to population growth, accelerated urbanisation and economic development, the quantity of wastewater generated and its overall pollution load are increasing globally. However, wastewater management is being seriously neglected, and wastewater is grossly undervalued as a potentially affordable and sustainable source of water, energy, nutrients and other recoverable materials. It therefore needs to be seen as a resource, rather than a burden to be disposed of. There are many treatment processes and operational systems that will allow us to use wastewater to meet the growing water demand in growing cities, support sustainable agriculture, and enhance energy production and industrial development. For further reading logon to World Water Day and go to the Make Waves button on the home page. Several years ago a friend asked me to give her advice about her garden which she said was out of control and too much work. When I visited I could see an immediate problem; her paths were too narrow. Wider paths would make it possible to walk through the garden side by side with a friend, and even provide better working space when it was time to weed or divide the collection of lovely perennials that comprised her garden. Shrubs have been my response to the desire for a low maintenance garden, one that would be different from my gardens in Heath, but would still give me beauty and pleasure. 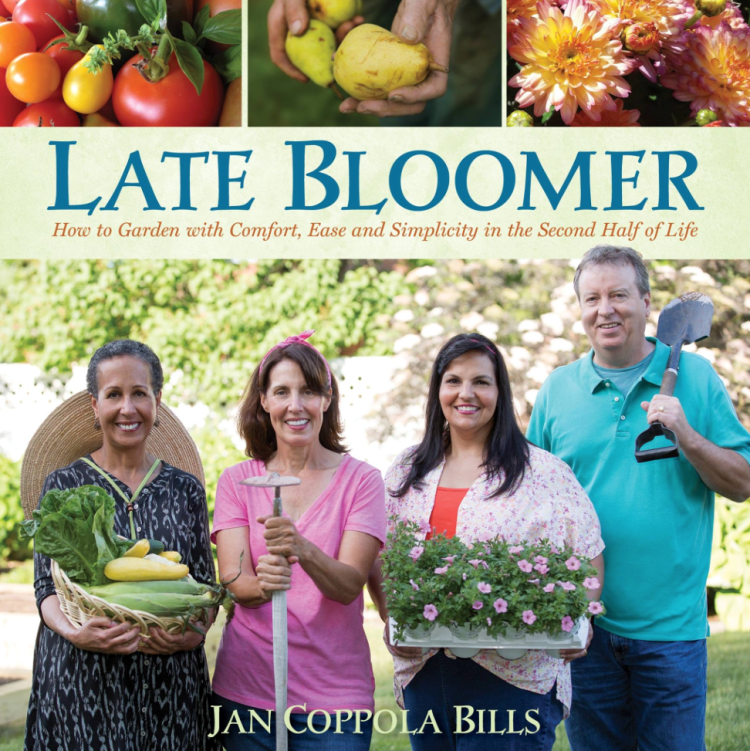 When Jan Coppola Bills sat down to write her book Late Bloomer: How to Garden with Comfort, Ease and Simplicity in the Second Half of Life (St. Lynn’s Press $18.95) she knew there were more and more gardeners who were in my position – loving gardening but without quite the stamina they had. Happily for me and other readers of this book with its useful and beautiful illustrations Bills has more that one answer to creating a low maintenance garden. Late Bloomer is divided into short illustrated chapters that begin with Simplicity and Sustainability and goes on to Garden Styling. Orderly Chaos, and Veggies, Fruit and Herbs and more. All the information and suggestions are useful to gardeners at any stage of their gardening career, but particularly valuable when a gardener sees the need to reduce the heavy labor required in their garden. Bills has a chapter devoted to different ways to handle weeds. She includes a section on what I call lasagna gardening which calls for lots of cardboard. One version of this begins with digging up the sod, flipping the sods, grass to grass, then laying on the cardboard and topping it with soil for planting and mulch. She also lays lots of cardboard right on the lawn where a new bed is needed and then covers the cardboard with a few inches of mulch. Then she says wait! Wait for the cardboard to decompose for a few months before you begin planting. When we moved to Greenfield and discovered how heavy and wet our clay soil was I could not wait. I needed to plant right away. I began my own version of cardboard gardening. I worked in one section of a proposed bed at a time. I collected all the cardboard I could (thank you, Manny’s) and ordered yards and yards of compost and mulch from Martin’s Compost Farm. First we skinned off as much grass as possible with a weed wacker and watered that section. I then planted the shrubs I had bought, hydrangeas, lilacs, roses and viburnams. I dug big planting holes, and used a good measure of compost when planting. 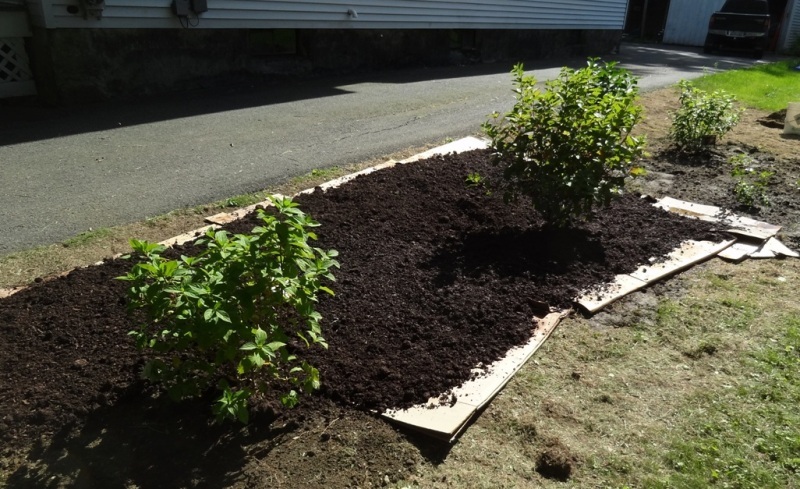 I gave all the newly planted shrubs a good watering and then laid out one or two layers of cardboard around the shrubs, filling that section of the bed. The cardboard also got a good watering before it was covered with several inches of soil and mulch and which were watered again. I feel all that watering is essential because it helps the decomposition process get started, as well as providing moisture for the newly planted shrubs. Once the beds were created I planted perennials and groundcovers between the shrubs in the soil and mulch. 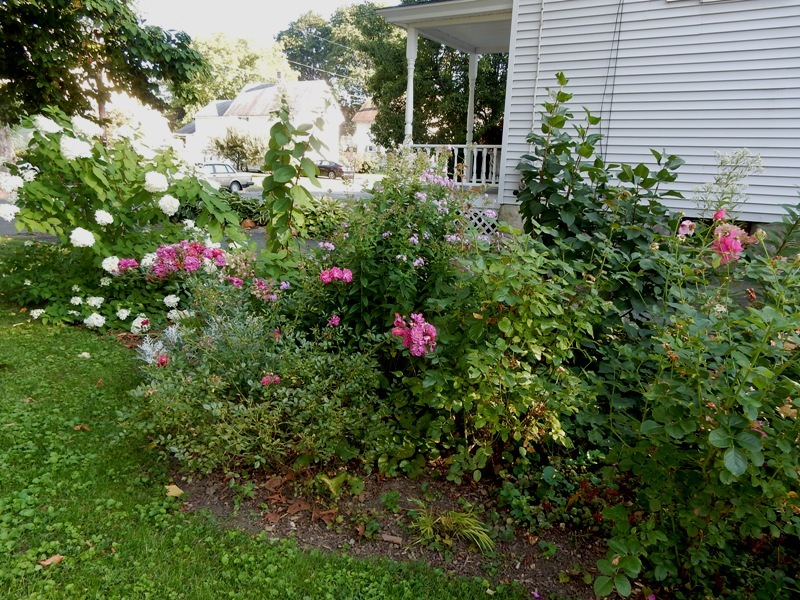 Those first plantings were put in in June 2015 and I am happy to say that the shrubs and perennials have done splendidly even though we did have such a dry summer and fall. I give a large measure of credit to the rich compost-soil mixture and compost- mulch mixture I got from Martin’s Farm. With all her advice, Bills does not forget the issues that are important to all gardeners, the desire to support our pollinators and butterflies who have been threatened by the use of many insecticides and herbicides and the benefits of using of using native plants in the garden. 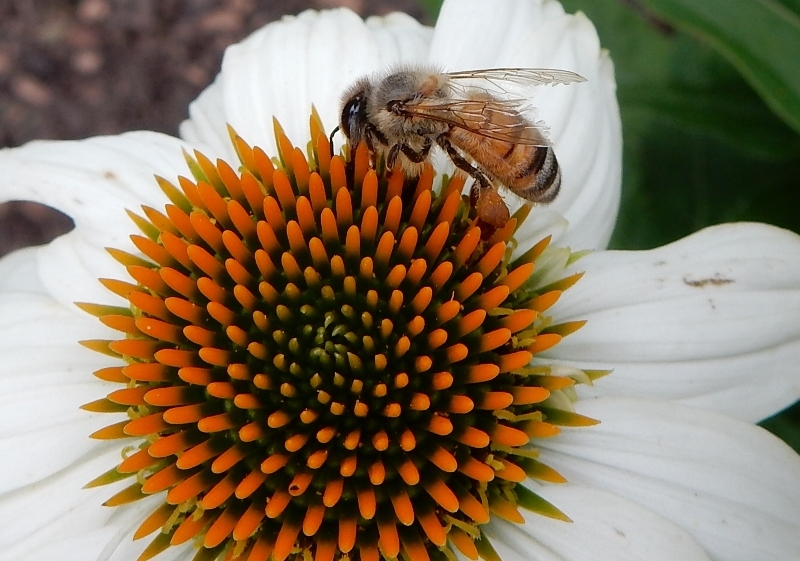 Native plants, trees, shrubs and flowers, provide the specific food that pollinators need to survive and propagate. As we have created our new Greenfield garden we had two main goals, to choose plants that were tolerant of wet soil (right plant in the right spot) and that were native cultivars supporting some of the 300 plus species of native bees, butterflies and many other pollinators. One of the useful lists Bills provides is a list of plants that will support pollinators one way or another. Dill does not provide nectar or pollen for butterflies, but it does supply food for the swallowtail butterfly caterpillar. Once I realized the importance of supporting all stages of the butterflies I was happy to plant extra dill and parsley to share. At my house my husband and I are apt to finish the project of the day with a sigh and the statement that what we have accomplished is “perfect enough.” We often remind each other that the weavers of beautiful Persian rugs always put a deliberate error in the design. According to Islam only Allah can make something perfect, and to make something perfect is an offense to Allah. There is not much chance my garden will be perfect, but I will care for it, love it, and share it. That’s enough perfection for me. “Chances are, you have never thought of your garden — indeed, of all of the space on your property — as a wildlife preserve that represents the last chance we have for sustaining plants and animals that were once common throughout the U.S.” Douglas Tallamy. Most of us welcome birds and butterflies to our gardens, but don’t spend much time thinking about bugs, except for pesky mosquitoes and Japanese beetles. Yet, even bugs, and there are hundreds of species of bug in our local landscape, are essential to our local ecosystem. When we lived on 60 acres in Heath I didn’t worry about having a healthy ecosystem. After all, we had those 60 acres that included wild fields and woodlands to feed the birds and butterflies. My intent in any planting was just to bring some of the best pollinator plants close to the house so that I could enjoy watching pollinators at work. Our move to Greenfield meant we had an opportunity to create our own wildlife preserve on our small lot. We also had to consider how to handle a large wet area. I was thrilled with the idea of making a garden that would welcome and support the butterflies and bees – and the bugs. My husband was happy that this kind of garden eliminated most of the lawn. The new lot was mostly grass, but this was not fine turf and I was happy to see the lawn was filled with clover and violets which provide lots of early pollen for bees. It was a happy day for me when I realized what some consider lawn weeds are really important nectar plants. Some of the pollinator plants that I brought with me from Heath include: spring blooming foam flower and irises; summer blooming coneflower, Russian sage, bee balm and yarrow; and fall blooming asters. 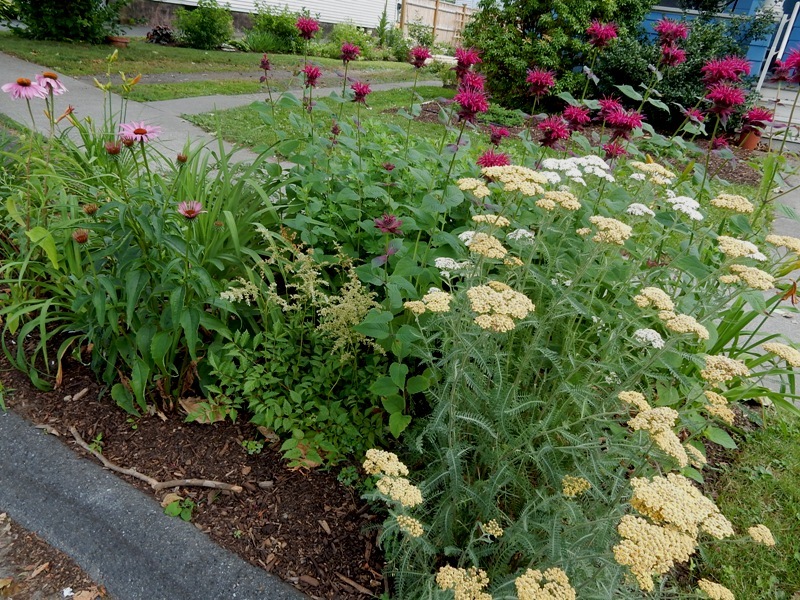 Yarrow and coneflowers make my hellstrip a pollinators diner. Then I turned once again to my favorite expert on sustaining wildlife, Douglas Tallamy, Chair of the Department of Entomology and Wildlife Ecology at the University of Delaware. He is the author of the brilliant and inspiring book Bringing Nature Home: How Native Plants Sustain Wildlife in Our Gardens. He also has a website, www.bringingnaturehome.net with lots of information and lists of plants that will help you bring nature to your home garden. Everyone loves butterflies, but I never thought of them as pollinators. They are not like honeybees who have the equipment to pack pollen into ‘baskets’ on their knees, but even with their smooth and spindly butterfly legs they do pollinate plants. Butterflies will welcome nectar plants but they really count on host plants, those plants where they can lay their eggs, confident that the hatching caterpillars will be able to eat that plant. Host plants for butterfly caterpillars can be quite specific. We all know that monarch butterfly caterpillars need milkweed. Other plants for other butterflies include spice bush or Lindera benzoin, clover, snapdragons, sunflowers, sweet fennel, parsley, dill, carrots, as well as sycamore, river birch, chokecherry, oak, poplar, locust and willow trees. Of course, there are many other host plants for the many species of butterfly. 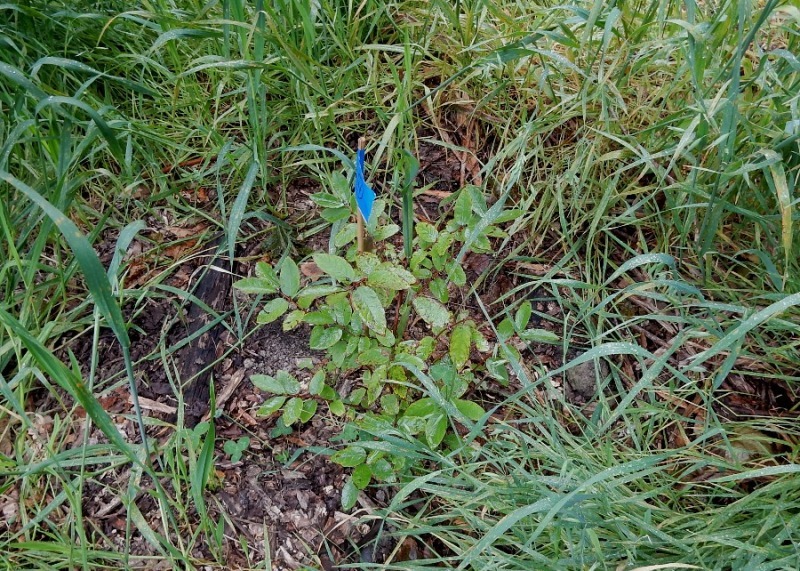 In our new garden we planted river birch, chokecherry and spicebush as butterfly host plants. We also planted orange milkweed, Asclepius tuberosa, a smaller showier milkweed than the kind found in the wild. Since host plants are so specific for butterflies there is no way I can support many species, but I am doing what I can. We are not purists, but we have concentrated on using native plants. Native plants and native bugs evolved at the same time over centuries. Native bugs know exactly the kind of greenery they need to thrive. And the native plants know they can spare some foliage to support the bugs without harming themselves. I do not get upset when I find insect damage on my viburnams. I know they can spare a few leaves. That does not mean I don’t go around with my soapy water to collect and drown the Japanese beetles that are starting to appear. Japanese beetles are non-native bugs, but they seem to enjoy roses and raspberries and my yellow twig dogwood. Nature is not neat. Strictly speaking, spiders are not bugs. But they eat bugs. I may not be very aware of their presence because many spiders are tiny, but big or small, all spiders are welcome in my garden. We have planted the eye catching native buttonbush with its bottlebrush-type flowers, and summersweet, Clethra alnifolia, with its fragrant white panicles of summer bloom. Both welcome bees and butterflies to sip their nectar, and neither minds wet sites. With those large shrubs I achieve two goals. 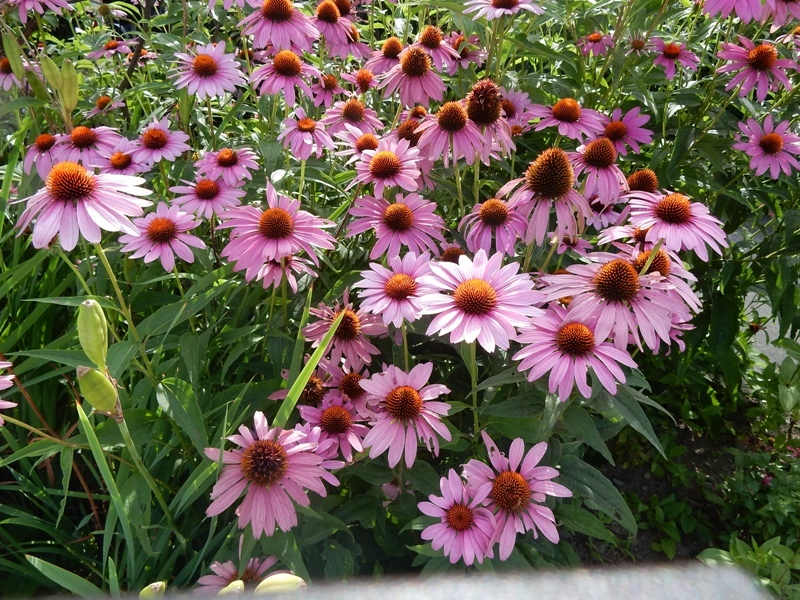 We have planted other excellent perennial pollinator plants that like or tolerate wet sites. Sanguisorba canadensis, American burnet, has tall 4-5 foot flowering spikes of flowers beginning in midsummer, as does culver’s root or Veronicastrum virginicum. Possibly more common is Joe Pye Weed, with its pink-ish flower heads. We have not completed our planting plan, but are well on our way to supporting butterflies, bees and other bugs. We are well on our way to creating a garden that is lovely and a joy. We are also learning many lessons along the way, another joy.